Ayia Fanaromeni Church, some video footage to give you an insight of how beautiful the exterior of this church is. Stunning carved golden stonework and a lovely bell tower. Inside it has a very beautiful painted ceiling. The church is situated in centre of the city before Plateia Eleftherias took over in 1974, Plateia Faneromenis is a quiet square, so silent that birdsong can be heard only metres away from the bustle of Ledra street. In the centre of the square is the impressive Faneromeni Church, built in 1872 on the site of an ancient Orthodox nunnery. It is the largest church within the city walls and is a mixture of neoclassical, Byzantine and Latin styles. The Marble Mausoleum on the eastern side of the church was built in memory of four clerics executed by the Ottoman governor in 1821, during the newly declared Greek War of Independence. This church is quite close to the green line and is Greek Orthodox. It is the burial place of Archbishop Kyprianou, executed in 1821 by the Ottoman Authorities. If you are visiting Ledra Street, it will be an ideal opportunity to visit the church, it is very nearby and will be located on any map that may have with you. 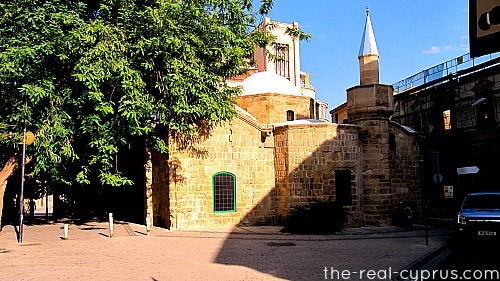 The small turkish mosque Cami Arablar is situated directly behind the church. This is a great example of a mixed gothic and Byzantine style apparently it was very popular in Lusignan times. Sadly it will probably be locked but you should be able to sit down under the shade of the trees and there is a little taverna nearby for a cool drink and some lunch. It closes around 4pm but will be open all day on a Sunday usually. Very popular with Cypriots so that is naturally a very good sign you will like it too especially if you are trying to avoid the expensive restraunts in Ledra street who are catering to the masses with burgers and chips and overpriced ice-cream. It is a shame but inevitable as there are now so many people who cross over into the North so you have a very captive audience. I think the restaurant is called Matthews or Matheos or something like that and it supposed to be one of the best in the area for "local food" with a menu that changes with the seasons. I really hope you enjoy your visit around this area of Ayia Fanaremoni Church and the Cami, it can be a nice little revelation when you are not expecting it.